Carol and i have just had a marvelous adventure. We went to Pier 24. I’ll give you some links, but first, my version of the back story. About six years ago a fabulously wealthy local investment banker named Andy Pilara more or less accidentally saw in a gallery window a photograph that so caught his eye that he stopped in his tracks and then went into the gallery where, for the first time in his life he was blown away by a piece of art. So of course he bought it. And then went back and bought others. And more and more and more, learning as he bought and amassing a huge collection (he’s rich as Croesus, remember). So then he realizes he sitting on this fabulous collection and wonders what he’s gonna do with it. Elementary, let others also enjoy it. So he gets a long term lease on one of the ramshackle piers left over from the days when San Francisco was a working port, shores up the crumbling structure, guts it, and creates an enormous temperature and humidity controlled display space for photography. His photography. The largest display space for photography in the country. And throws it open to the public. Free. But only by reservation. For something like a couple of dozen people at a time which guarantees unobstructed views and a quiet experience. You can stay for only two hours. But yes, that’s enough time because he’s presenting the collection in chunks of a few hundred at a time. The current exhibition is the second, titled HERE, and is material mainly from local photographers and includes works such as Eadweard Muybridge’s 1878 panorama from the Mark Hopkins displayed just above Mark Klett’s 1990 panorama from almost the same vantage. Not that any of this information is posted on the wall beside the photographs. Oh no, the only data provided about the photographs is in the handsome, free brochure you are given as you enter, and that merely lists the names of the photographers (a maximum of three) represented in each of the 22 rooms. Period. Tough art love. No spoon feeding. Late note: In November i went back to take Gloria, and now they have a brochure that lists the artist and title of every photograph. And did i mention that it’s all free, free, free? Here we have a sterling gentleman in the mold of Bill Gates and Warren Buffett who, having amassed a fortune comes to the understanding that there is something better to do with his wealth than follow the example of the Waltons and the Koch brothers and devote it to making certain that not a single cent escapes the family or worse yet, provides an amenity for the less wealthy. A round of applause for Andy Pilara. Three rounds of applause. Here’s an article that appeared in the San Francisco Chronicle last year before the first exhibition opened. And here’s a link to the official website, which has more information including how to make that reservation. You really must see this exhibition. I’m sick at heart that i missed the first one, but for sure i’ll never miss another. Carol and i were stunned by the show, and as we staggered out i noticed that my eyes had somehow been recalibrated and were seeing potential photographs everywhere i looked. I was so completely enthralled that i whipped out my little Panasonic and started taking shots of the rusting rail line between the piers. Then i heard a man speak behind me and turned to see this guy entering the door carrying a framed and wrapped object. He was saying something jocular to the effect that i should send him a copy so he could display it. And no, you’re not seeing any of the miserable shots i had just taken. One of ’em had enough potential that i’ll go back down there on a nice day with my big Panasonic and try for the shot i missed. And maybe then i’ll post it here…but you’ll have to promise to let it be our secret from Andy. Wouldn’t want him pestering me. 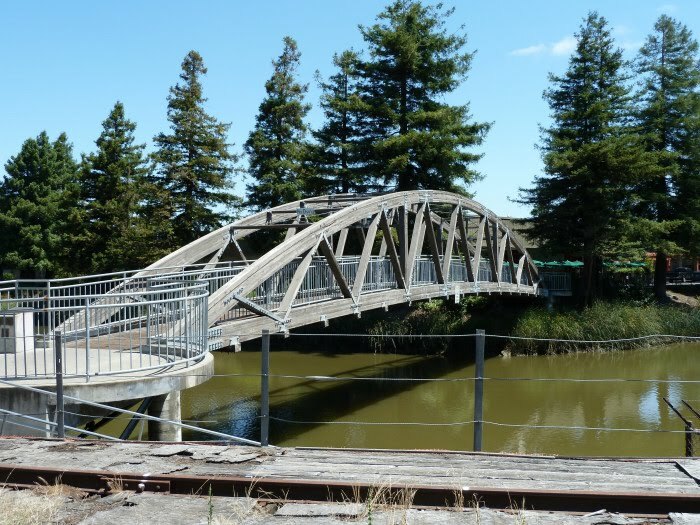 And for now i’ll substitute a pic i took of one of the eight bridges spanning the mighty Petaluma River, this one downtown and for pedestrians and bikes. Trying to get in training for Amsterdam.